Silver Metallic Cream Makeup.Includes: One Tube of 0.7oz Silver Metallic Cream Makeup. *Accessories Not Included. Sold Separately. Complete your costume with this Silver Metallic Cream Makeup! A great makeup choice for the Tin Man! Emerald Witch Adult Costume.Includes: Bubble Dress,Overdress with Brooch, Witch Hat and Green and Black Striped Tights.Available Size: Womens - Small (6-8), Womens - Medium (8-10), Womens - Large (10-12), Womens - XLarge (12-14). 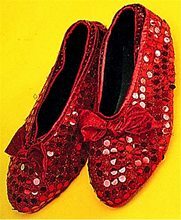 *Broom and Shoes Not Included. 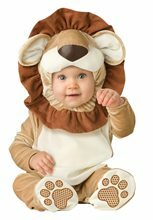 Lovable Lion Infant/Toddler Costume.Age Category - Infant/Toddler.Includes: Bodysuit and lion hood.Available Size: Infant - Small (6-12 Months), Infant - Medium (12-18 Months), Infant - Large (18 Months-2T).Product Care: Hand Wash Cold Separately, Do Not Bleach, Line Dry, Cool Iron if Necessary, Do Not Dry Clean.Little Lion is ready to roar... This is a perfect costume for Your baby! He will look irresistible in this Loveable Lion costume. 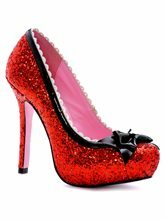 It is a great choice for boys or girls to wear for their first or second Halloween. 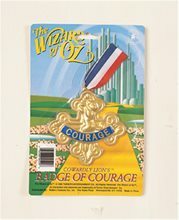 The Wizard Of Oz Badge of CourageIt has Courage written on the badge.It is one size Fits all. 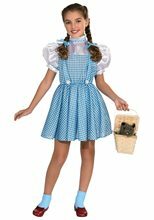 Dorothy Girl Costume; Includes: Hair bow & dress Material: Polyester except trim Care Instructions: Hand wash. Line Dry. Cold water. No bleach. 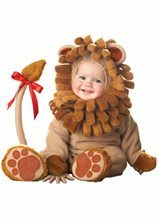 Little Lion Baby Costume.Includes: Lined zippered bodysuit, attached tail with bow, booties, hood with ears and plush mane.Available Size: Newborn (6-12 Months), Infant (12-18 Months), Toddler (18 Months - 2T). 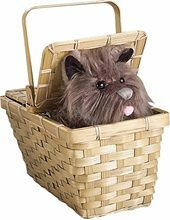 (See Size Chart For More Information)This Infant Premium Lil Lion Costume includes a deluxe velour lined zippered brown body suit with attached tail with bow, a pair of premium character booties and a deluxe character hood with ears and plush mane. This is a premium child costume. Available sizes: Newborn (6-12 Mo.  ), Infant (12-18 Mo.) and Toddler (18 Mo. - 2T).